Salad spinners, sometimes called “salad tossers”, are special devices for washing salads and then removing the left-over water from the clean produce. 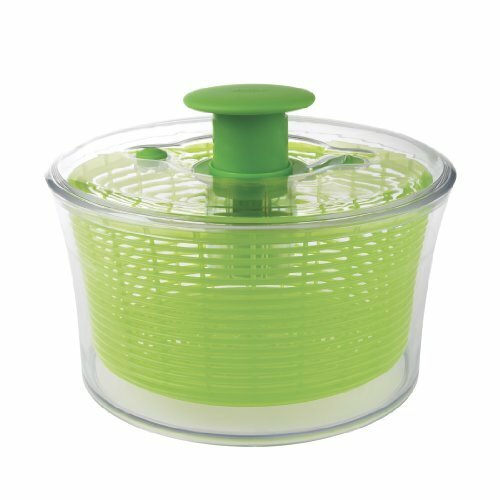 Salad spinners are comprised of a removable inner colander that is surrounded by a bowl, which is in turn inside of an outer cover that includes a spinning crank or other turning device. First, water is added to the salad in the colander and washed. Then, when the device is initiated, it spins the colander, which causes water to be driven out through the holes and into the bowl outside through centrifugal force. This keeps the salad from being too watery, allowing salad dressing to coat the greens better, and keeps the leaves staying crisp and delicious. So which salad spinner is the best choice for you? We have compiled a list of some of the best spinners money can buy. Take a look below to see which one is the right fit! The OXO Good Grips Salad Spinner is arguably the top-selling spinner online, and it is actually an extremely interesting item. 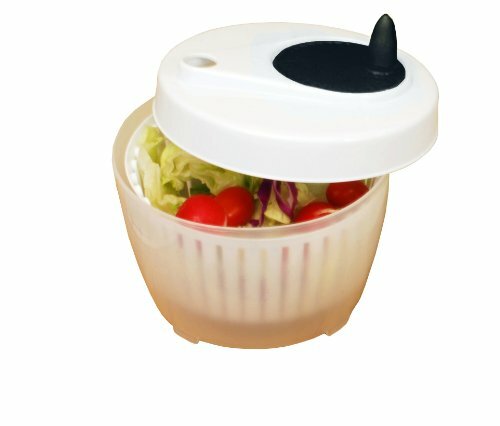 While most other salad spinners operate by means of a crank system, this one utilizes an extremely user-friendly push-button on the lid, which was apparently inspired by a children’s toy top. This is purportedly a method that is both satisfying to use, and which requires less muscle force than other methods. According to OXO, the exact amount of force needed to remove water droplets from greens was calculated during development, assuring perfect water removal every time. 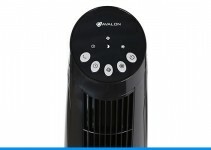 User feedback indicates that all of these aspects make this spinner a truly innovative and exceptional kitchen item. However, perhaps the most interesting aspect of this spinner is not in its use as a cooking tool, but in a truly surprising application that has recently come to light. This spinner implements centrifugal force so well due to its innovative design and high RPM that it has actually begun being used as a centrifuge for separating blood constituents for testing in remote places in the world. How’s that for an endorsement! If you have a large family or love to host dinner parties, this Indy Chef Salad Spinner could be the optimum choice for you. It boasts a very large, transparent, 5-quart bowl — one of the largest sizes on the market today — to make preparing even the largest salads easy. A non-slip bottom keeps the spinner from moving on the counter during use, and features a manual stop button so that you can halt the spinner the moment your produce is dry enough. 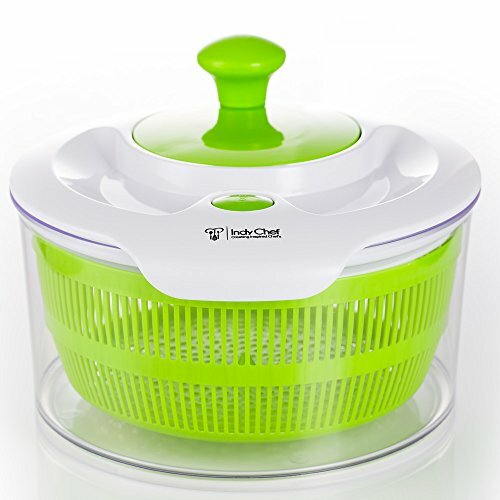 The Indy Chef Spinner includes a nice lettuce knife, and a storage lid that fits to the bowl so that the unit doubles as storage container. Not everyone needs 5 quarts of salad at a time. For those who would like a less hefty output, the Xtraordinary Home Products Mini Spinner may beat out the competition. With its small size (approximately 3/4 gallon) and smaller price tag, it’s perfect for quick, healthy lunches, or dinners for one or perhaps two people. It is reportedly easy to wash by hand, but also compact enough to fit in the dishwasher. Users report high-quality construction and ease of operation — so easy, in fact, that people find that their children enjoy helping them make the salad. Best of all? Their kids then become enthusiastic about eating more of the salad they helped to make! 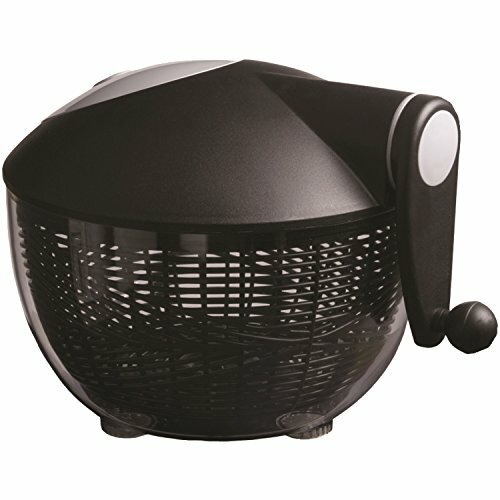 Another in the OXO line of innovative spinners, the OXO Softworks Salad Spinner implements the same push-button system as detailed in the OXO Good Grips spinner above. 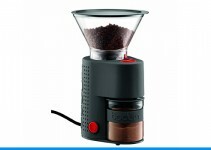 Also only requiring one hand to operate and once again featuring a built-in hand break to instantly stop spinning, it is another solid buying choice from OXO. With so many features in common, the choice between these two popular OXO spinners seems to be mostly a matter of taste. However, some users have reported that this model is slightly more difficult to stabilize while it is spinning, due to its rounded shape. For this reason, some users do like the OXO Good Grips spinner better. 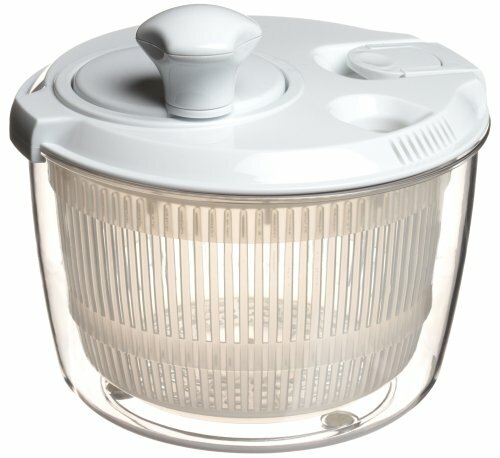 A nice, very large, BPA-free spinner, the Culina 5-quart Salad Spinner incorporates a crank-style mechanism like many of the others. 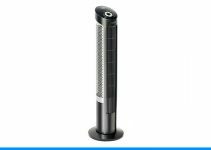 However, this model has been specifically designed with its crank handle fitting more closely to its side, so it is easier to maneuver and store when not in use. It receives praise for being very durable, with even the most heavy-handed of salad-makers reporting the “inability to break it”! The Culina Space-Saving Spinner is said to be extremely useful for those looking for a spinner that leaves salad greens truly dry, for purposes such as making homemade fried spinach or kale chips. On top of its usefulness in ordinary kitchen endeavors, some users even report success drying items of clothing in their Culina spinners! 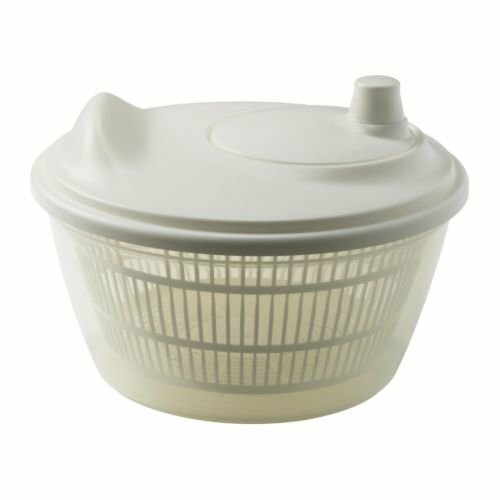 This Ikea Tokig holds around 3 quarts, making it a nice, medium-sized salad spinner. Although some consider it to be slightly less sturdy and durable than similar spinners on the market, for the lower Ikea price users generally feel the Tokig is a solid choice for the savvy shopper. It implements the common crank system, which, for a less expensive model such as this, is preferable due to the fact that manual systems are less prone to malfunction than their more complex, automated counterparts. The Tokig also receives positive marks for ease of use, and for being reasonably large but not too large for easy handling. The Starfrit is another salad spinner with a smaller price tag that still earns glowing reviews. On the larger side of medium at a volume of about 4 quarts, it’s a great choice for those with large families or who like to host dinner parties. A side-mounted crank handle operates the unit, and users report that with only two crank revolutions the basket is already spinning at high speed. This model also incorporates a stop button to halt the spinner’s movement as quickly as it starts. All in all, the Starfrit has been found to be extremely sturdy and long-lived, even with frequent usage, and users generally have nothing but praise for their purchase. 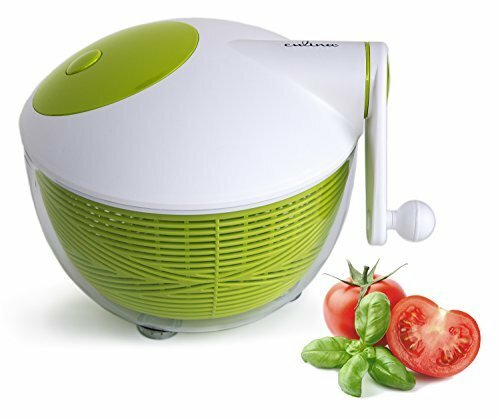 One or two spins are all that are needed to drain the water from your salad with the Excelsteel Cook Pro Mini Salad Spinner — proof that these machines don’t have to be big to be powerful. At only 1.4 quarts, it is much more convenient to handle and store than its larger counterparts, and prepares the perfect size salad for an individual or couple. This tiny dynamo features a top-mounted crank knob and a bottom drain with a cover that can be opened or closed depending on your needs. Built with resilience in mind, there’s no need to worry if it is dropped, as its flexible design makes it likely to be still as strong as ever afterwards. At a whopping 5.2 quarts, the Kuisiware OneSpin is big enough to suit just about any need. And with a paddle mechanism as its operating method, it is also a surprise in terms of design. This paddle functions much like one of the push-button style spinners above, but the longer-lengthened push-surface gives more leverage to the user, thereby reducing the amount of force needed to operate it. In fact, this feature is one of the Kuisiware OneSpin’s main selling points, as this makes it a good choice for older individuals and those with gripping issues such as people with arthritis. A non-slip rubber surface on the bottom of the bowl adds to its ease of use, and users can be confident in its contribution to their healthy lifestyle, as the unit is BPA-free. If you’re looking for the salad spinner that has it all, the Smithy Co. Deluxe Spinner might just be the perfect choice for you. Truly unique from the other spinners on this list, the Smithy Co. Deluxe is immediately recognizable as something special due to its attractive and sturdy stainless steel construction. Though admittedly a bit costlier than the others, it is worth noting that it this not just a high-quality spinner, but also a set of very elegant stainless steel tools. The colander is removable, so that if desired, it can be used to wash or drain produce or pasta independently of the rest of the unit. The bowl, with its elegant metallic shine, doubles as a very lovely serving bowl, and a sealing storage lid is included so after dinner it can be transformed yet again into a nice storage container. The Smithy Co. Deluxe gets very high marks for both its spinning function as well as the other uses, so if the price tag fits in your budget, it is an extremely tough contender among the other spinners on this list. Whatever your needs are in a salad spinner, there are enough really good ones out there that you can surely find the perfect fit for you … and those on this list are awfully hard to beat!